Dalat is long time ago known as one of the most famous place in Vietnam. If you come to Dalat but not yet visit and use your own hand to collect some delicious red strawberries, then you will regret it for sure when come back home. These strawberry gardens attracted many visitors for years. People who love travel on their own, however, prefer non-service garden just to have the opportunity to try picking strawberries like real gardeners. There are gardens beneath deep valleys, where cannot be reached by motorcycles, so visitors who want to go picking strawberries have to ride up the slopes and walking down to the garden. Guests often come to laden strawberry gardens for hand picking the ripe berries and even eat in the garden to enjoy the sweet fragrance of ripe strawberries strawberry tree ... Now the garden is growing a lot of Dalat berries such as French strawberries, Japanese strawberry, New Zealand strawberry, Taiwan strawberry, “Da” strawberry, “Huong” strawberry... the most easily to grow and cheapest are “Da” strawberry and “Huong” strawberry. The imported berries is sold at higher prices, bigger in size and color is also more beautiful. Many Dalat garden was applied hydroponic method in greenhouses. Strawberries are grown entirely on the rack, above a mesh shade, beneath a fan to cool the plants. Spray irrigation systems, modern drip irrigation. 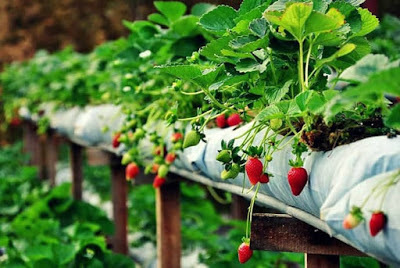 In addition, there are garden strawberry temperature measuring device, trapping insects ...; using natural enemies to deal with pests, not using chemicals. The mulberry tree is always cared for clean and safe condition (VietGAP standard), evening temperatures in the garden always maintained from 14 degrees C to 18 degrees C maximum in the electrical system, even one must meticulous pruning each dried leaves, withered. Surely visitors will immensely enjoy being hand selection and picking the ripe berries round base is dangling on the branches. More specifically, tourists can taste even the bitter, the sweet delicious fruit only in cold countries. Friendly Dalat tour will be extremely excited before the eyes garden green strawberries. The garden where the owner is always enthusiastic and fun with visitors. They will give travelers the small box to store strawberries picked by their own hands. The nature of Da Lat people which is very sincere and friendly. Although visitors do not buy all the garden strawberry will also be enthusiastic tour guide and plans for garden strawberry heard stories about farming. They also introduce visitors to the food and drink is made from the delicious strawberries nutritious.